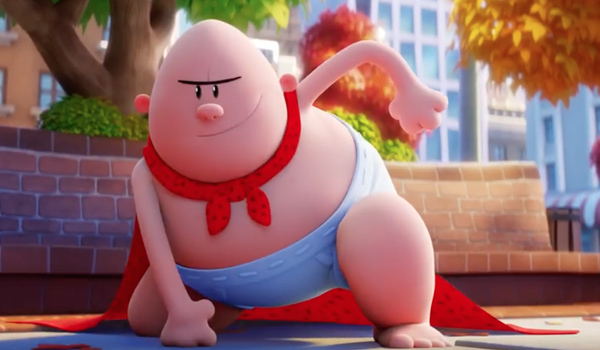 As I waited for the screening of Captain Underpants: The First Epic Movie, I had to endure a series of trailers for forthcoming attractions to keep the younger generation happy, most of which were animations. All of which looked terrible. Which made me worry about the feature that was about to start. The trailer for this didn’t look that promising and to be honest, we have already had a couple of animations that either failed to deliver or were just downright awful. I need not have worried. Captain Underpants is a blast! And Dreamworks’ best animation in years! 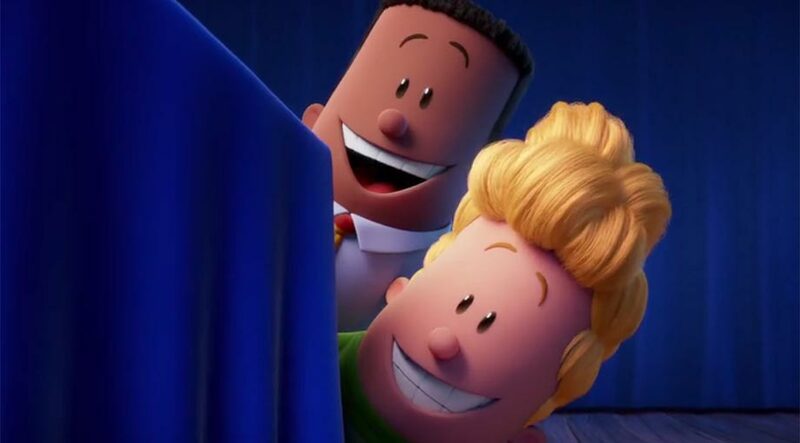 Harold and George are best friends who share a love of laughter and have created a series of comic books, one of which is about a hapless superhero called Captain Underpants. They both go to the same school run by the principal Mr Krupp, who hates the boys so much, he is determined to separate them so their friendship will end. His plans go awry when the boys hypnotise him and he believes he is Captain Underpants. 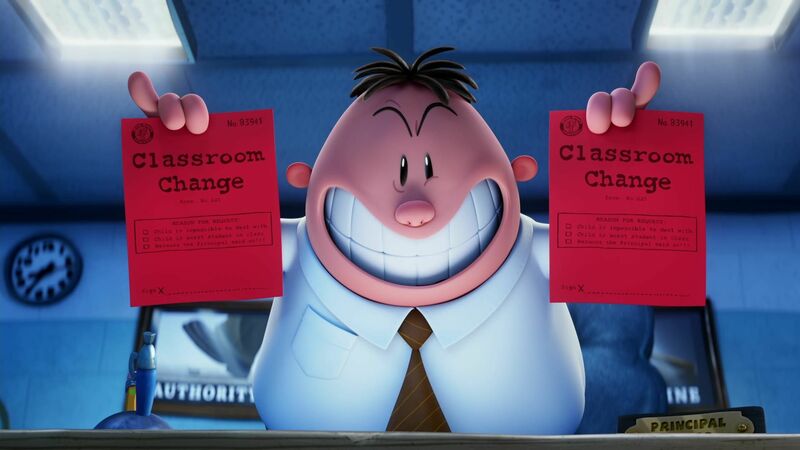 More trouble arrives at the school when a new science teacher plans to remove laughter from the children and it’s up to Harold and George and their new superhero to stop him. 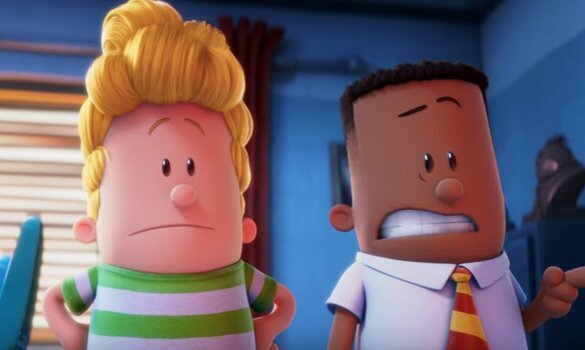 Based on the best selling children’s books by Dav Pilkey, Captain Underpants relies quite heavily on the humour being of the slapstick kind as well as plenty of toilet humour, which is something that doesn’t normally work. It’s easy to get a cheap laugh from a bodily function or a flatulent noise. Thankfully, in the hands of The Muppets writer Nicholas Stoller and Shark Tale director David Soren, they come up with enough invention and a solid understanding of how jokes work to make these moments very funny. The success of the books is that they are so ludicrous and outrageous, something the filmmakers haven’t forgotten about. What is more surprising is how infectious the comedy is for adults. I found myself laughing harder than the young audience who were in the same screening. One particular scene, an inventive orchestra, was a huge highlight, finishing with a collection of reviews flashed on the screen and ending with the funniest, “Winner, winner, chicken dinner!” This is the level of jokes the film has. It’s not just a slice of entertainment for kids but there’s plenty for the adults to laugh at too. In fact, while it has jokes about breaking wind and nose picking, there runs throughout a kinder, more tender heart which isn’t over sentimentalised and schmaltzy: that of friendship. The relationship between George and Harold is one that you can easily recognise as adults. We all had a best friend when we were young who had the same sense of humour, liked the same things and even had a mutual bonding towards. This film captures that superbly, which is why it is so enjoyable to an older audience. It also helps that the voice talent are perfect for their characters. Kevin Hart and Thomas Middleditch have superb chemistry, even though we cannot see their faces, yet you hear the warmth in their voices. They come across as best friends and we get swept along by their joyfulness. It is totally infectious. Ed Helms is also very funny as Mr Krupp and his alter ego, Captain Underpants, while the rest of the cast exude energy throughout. With all the crass, cash-ins animations that are around or coming soon, how refreshing it is to say that a film has come out of nowhere and literally stolen this reviewers heart. It’s fresh, inventive and incredibly funny and I don’t think I could ever look at another whoopee cushion again without thinking of this film. Don’t worry if you don’t have kids to take to see it. Don’t make any excuses. Go and have a really good time.